Whether they are notch-y, slide-y, dual-screen, or simply with bezels trimmed to the maximum possible, "all-screen" phones have now become mainstream, forcing manufacturers and mobile OS providers to rethink navigation away from bottom-feeding buttons or virtual strips. Navigation gestures have been around for a while, but there is a renewed focus on employing them at a system level, both on iOS and by Google. With Android phones, of course, manufacturers can freely add gestures on top of what Google has hard-coded as options resulting in a richer variety of options that we are now going to preview for you by platform and brand. The days when you had to root, jailbreak or install third-party apps in order to forego stretching all the way up or down while holding the phone with one hand are (almost) gone, so here is how everybody is coping with "all-screen" phones gesture navigation at the moment. The iPhone X was unlike any phone Apple had released by that moment, and not only because of the unsightly "notch" protrusion from its top bezel. That notch allowed Apple to fit the newly-minted Face ID kit there, and still brag with a 5.8" diagonal, more than any of its other phones at that point, at least on paper. Despite the giant protrusion at the top, Apple managed a nice screen-to-body ratio percentage by trimming the bottom bezel significantly, but that had one side effect - no home button. With the 2018 iPhone crop, Apple killed its iconic home key for good, carrying over the simple iPhone X gestures that were seemingly easy for people to adapt to. Samsung is a bit handicapped when it comes to navigation gestures, as the sides of its curved OLED displays are doing their People Edge or other duties, so busting a move from there is out of the question for now. It already has a pull-down and swipe-up gestures on an empty screen area to bring the notification shade from the clouds or open the app drawer, therefore the only side left for a new navigation party, is the very bottom. 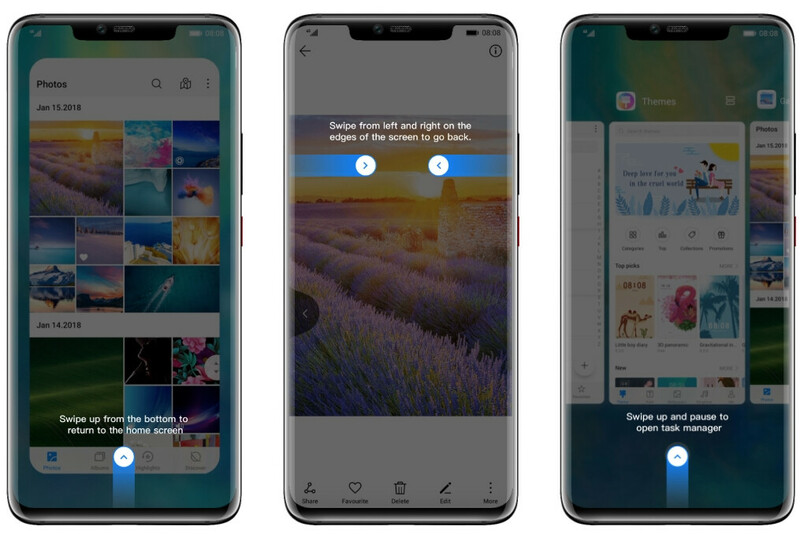 That's exactly what the new One UI does - its gesture navigation option replaces the bottom strip with three even-spaced "pills" for home, back and recent apps, or you can hide those altogether and only swipe by muscle memory. Unfortunately, except being more aesthetically pleasing by doing away with the navigational strip, these gestures add no value to the navigational ergonomics, as you have to stretch even further down with your thumb to execute. We won't comment on the smoothness of the One UI gestures until it hits a retail stage, of course, but the basic concept is unlikely to change until then. Huawei's gesture-based interface option tries to, thankfully, incorporate the sides of the new Mate 20 series, and the P20 will join when it gets the new EMUI 9 with Android Pie. We know what you are going to ask - does going back by swiping from the screen edges works well with cases on? It does surprisingly well, at least with the official silicon case that comes in the Mate 20 and 20 Pro boxes. Moreover, Huawei didn't complicate things further by asking you to guestimate where does the home button gesture area end and the recent apps one begins like Samsung. It just did what Apple does with the notch-y iPhones, and incorporated one move for both home screen and recent apps calling by simply holding the swipe-up gestures a bit longer. Chinese phone makers have never shied away from big-screen phones that are, well, big in Asia, and have been incorporating gestures into their interfaces from times immemorial. Given that OnePlus has wiggled its way onto US carriers like T-Mobile, we are using its approach as an example, but Xiaomi and other smaller than Huawei Chinese makers have been having gesture navigation before it was a thing. They are now much more polished, though, given that Google has incorporated them in Android on a system basis. 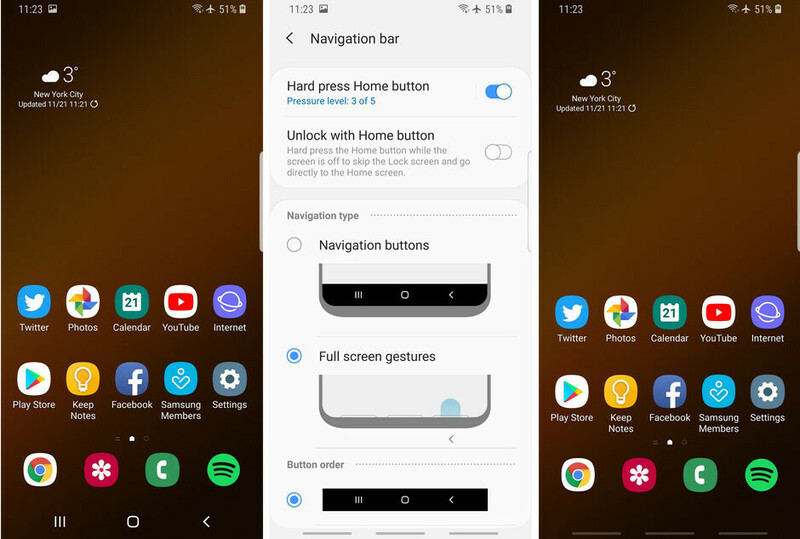 On the OnePlus 6T, for instance, you can choose from a traditional strip, Android Pie navigation indicators similar to what Google's Pixel 3 has, or a clean bottom with no navigation visuals. Should you choose the latter, the OnePlus 6T indeed becomes "all-screen" at the front, at least from a navigational perspective. Intended to be a showcase of the new Android navigational system that ditches the familiar virtual buttons strip, the Pixel 3 and 3 XL got anointed with the obligatory pill-shaped home indicator, but also a back button to the left of it. Swiping up from the pill brings the multitasking view with current app frames to swipe between, pick or flick away. Below them, you can now find the search field and a few often used apps for added convenience. This system works and it works fine, with the typical Pixel smoothness. There is still no going back by swiping from the sides though, though, and you still have to stretch all the way down and to the left to reach the most used navigation key on your phone. Google hasn't given you the options to customize or bring back the navigation bar of yesteryear, so the learning curve might be steeper. Whose navigation gestures approach do you prefer? Yes, CC was a great when it was accessible from the bottom, now it's kind of cumbersome to use. Why would he be? BlackBerry 10 has the best gesture based navigation. It's 5 years later and BB10 is in maintenance mode and it's gesture navigation is still the best (along with MeeGo). I don't know which is the best, but I'm convinced that the Pixel version is the worst. Nothing beats Blackberry 10 OS in terms of gestures and navigation. 5 years after it's release. The need to use two hands to get to control center (or impressive acrobatics) on the iPhone Xs Max should be a con. It's not efficient if you need two hands. Still bad. I think a long swipe up could be used to open CC. Reachability is a bit of a joke. Not the best solution to this problem by far. Indeed. Blocky and cartoonish due to big icons but very smooth and user friendly. Price against useful features, I think pocophone should be the phone for 2018. Even at 2018, windows phone gestures is still the best ui for me but for the sake of present times, I dig pocophone then oneplus 6t. Ahen it comes to gestures, apple surely does the best. Its the most intuitive phone ever, even teh competition needs more ram to get as smooth as apple but it wont come close. I'm feeling you're one of their marketing representatives. Apple users I know complain a lot with gestures. The extra ram android offer is not for gestures, they're meant for running heavy multiple background apps because phones are meant to be workhorse. Give it up, many phones, even the midrange already surpassed iphone this year. Try using oppo r17 for a weeks with nova launcher. If you ignore the brand, you will think it's an expensive flagship phone. Really? All speed and RAM tests on YouTube show iPhone XS as king even against phones with 8GB of RAM. Give it up. You look stupid now. In your dreams. I used both and iPhone is miles ahead (a meter here, a meter there - put them all together and you have a mile). The only one that comes close (out of the phones that matter) is Mate, with Performance mode active. A single video on YouTube means nothing. But your biased opinion on PhoneArenas webside shoild be valid? What are you drinkin mate. I have never imposed my opinions on anyone. Just believe whatever you want to believe, what do I care? does that make you feel good about your life? why are people getting confident in their phone, the only people who have the right to brag about what phone is faster are the people who designed and engineered the phone. you all act like your the ones who made the phone. Apples gestures make the most sense. The swipe left and right on the bar at the bottom to go between apps is genius and easy.